So called “Nerds” are notoriously thought of to have a hard time picking up a lady. Maybe these will help?? Baby you turn my floppy disk…into a hard drive. It’s not the length of the vector that counts…it’s how you apply the force. You must be the square root of two..’cause I feel irrational around you. 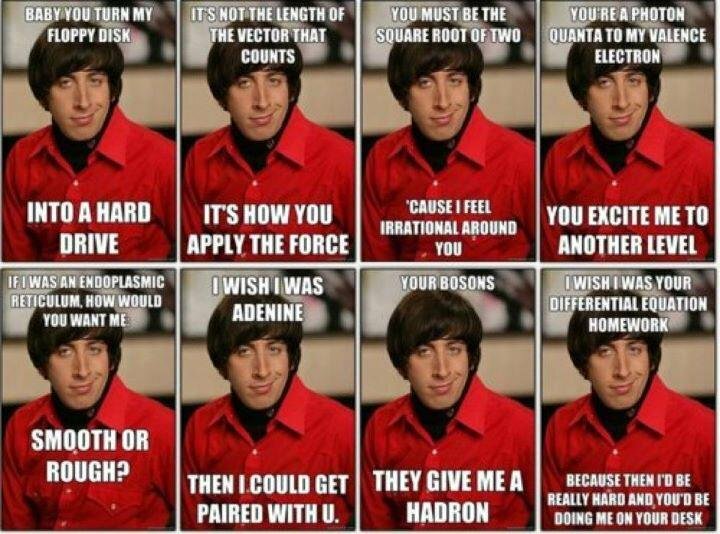 You’re a photon quanta to my valence electron..You excite me to another level. If I was an endoplasmic reticulum, how would you want me…smooth or rough? I wish I was Adenine…then I could get paired with you. Your bosons…they give me a hadron. I wish I was your differential equation homework..because then I’d be really hard and you’d be doing me on your desk.